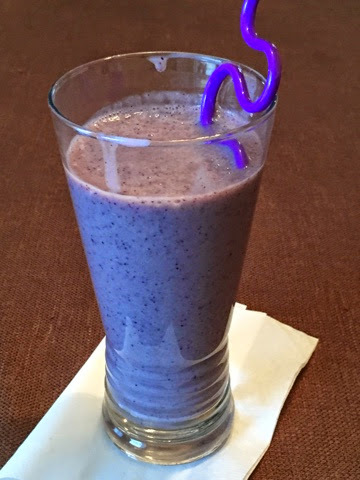 Today I have tried this smoothie with only fruits, it is so tasty, here is the recipe, njoy! Place peeled banana, blueberries, peeled oranges, almonds in the bullet cup. Close the lid tight and process for 30 sec until everything pulverized. Now add milk and pulse for another 30 sec. Add water and pulse for 30 sec, now your smoothie is ready. Pour this into a tall glass and enjoy every single bit of it! Until then take care, bye! this is a healthy smoothie...Good way to have few fruits in a cup.Looks delicious and creamy!